Rodney Cline Carew was born on a train in Gatun, Panama on October 1, 1945. He moved with his family to New York when he was fourteen years old, and signed with the Minnesota Twins on the day he graduated from high school. Rod Carew is one of the most talented players to ever don a major league uniform. During his illustrious nineteen-year career he was selected to eighteen All-Star teams. He is the all-time All-Star vote leader with thirty-three million votes – six million more than the runner-up. His career statistics explain why on January 8, 1991, he became only the 22nd player in history to be voted into Baseball’s Hall of Fame on the first ballot. In his twelve seasons with the Minnesota Twins, and seven with the California Angels, Rod amassed 3,053 career hits, twelfth on the all-time list at the time of his retirement. He won seven batting titles, a figure surpassed only by Ty Cobb, Tony Gwynn and Honus Wagner. Rod and Willie Mays are the only players in baseball history to be Rookie of the Year (1967), Most Valuable Player (1977), have 3,000 hits (1985) and be voted into the Hall of Fame (1991). He was also named the Roberto Clemente Award winner (1977) by Major League Baseball as the player who best exemplifies the game of baseball, sportsmanship and community involvement. He was only the third person to have his uniform (#29) retired by two teams. A more complete list of his incredible career achievements are listed on the attached pages. Upon retiring in 1986, Rod decided he would devote his time to working with children. 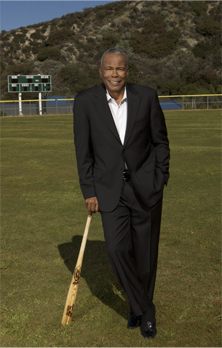 He realized a life long dream in the spring of 1987 when The Rod Carew Baseball School opened in Placentia, California. The 7,400 square foot state-of-the-art hitting laboratory was a tremendous success from the day its doors opened. The Rod Carew Baseball School became a valuable resource to major league teams as numerous players, managers and hitting instructors turned to Rod and his methods. When he felt the urge to return to the major leagues, Rod signed with the California Angels in 1992 as their major league hitting instructor. His impact on the Angels was indisputable as the team batting average rose more than thirty points during Rod’s tenure with the club. In November 1999, Rod was named Major League Hitting Instructor for the Milwaukee Brewers, a position he held until he resigned in October 2001. When he’s not preaching his art and science, Rod spends a lot of his free time in pursuit of funds to be used in the fight to find a cure for pediatric cancers. In one memorable and emotional appeal by Rod to a joint session of Congress in the fall of 1998, $50,000,000 was appropriated to the National Institutes of Health for pediatric cancer research. In the past ten years, the Rod Carew Childrenâ€™s Cancer Golf Classic has also raised more than four million dollars in this fight. In addition to his Hall of Fame honors, Rod received the 1991 Muscular Dystrophy Association Life Time Achievement Award in recognition of his accomplishments on and off the field. Past winners include Joe Montana, Wayne Gretzky and Magic Johnson. Rod was also honored by General Mills in 1991 when he became one of the select few to ever be featured on a Wheaties box. That year Rod was also named Captain of the American League All-Star team. In August 2002, Rod was inducted into the United States Marine Corps Sports Hall of Fame, as he served in the Marine Reserves in the late sixties. Today, in addition to his charitable works, Rod is still actively involved in baseball. He is currently in his 16th season on the executive staff of the Minnesota Twins and his 10th with the Los Angeles Angels of Anaheim. In the summer of 2016 the award for the MLB American League Batting Champion was named the Rod Carew Award. In September 2015 Rod suffered a massive heart attack. He had an LVAD (left ventricular assist devise) implanted into his heart. On Dec 16, 2016 Rod received a heart and kidney transplant. The donor was 29 year old former NFL player Konrad Reuland. He continues to do what he knows and loves best. He imparts his knowledge of baseball to amateurs and professional players alike. Rod and his wife Rhonda also lead the fight for heart health awareness through a campaign with the American Heart Association.